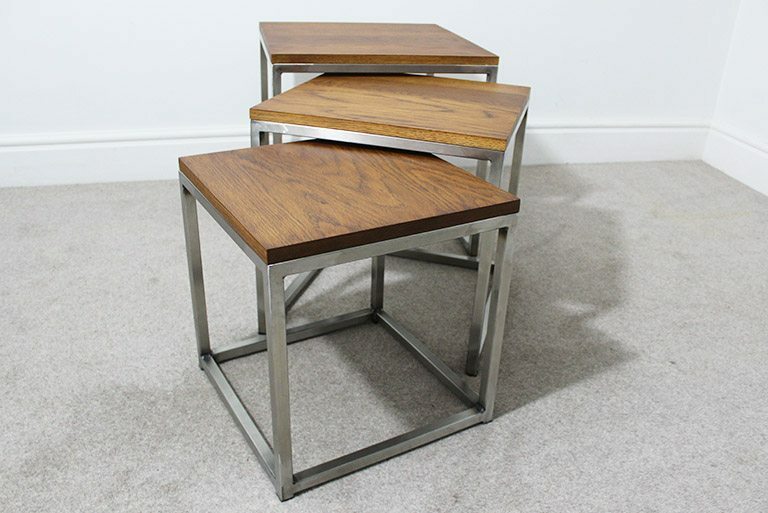 View our selection of Vintage Industrial Coffee Tables. 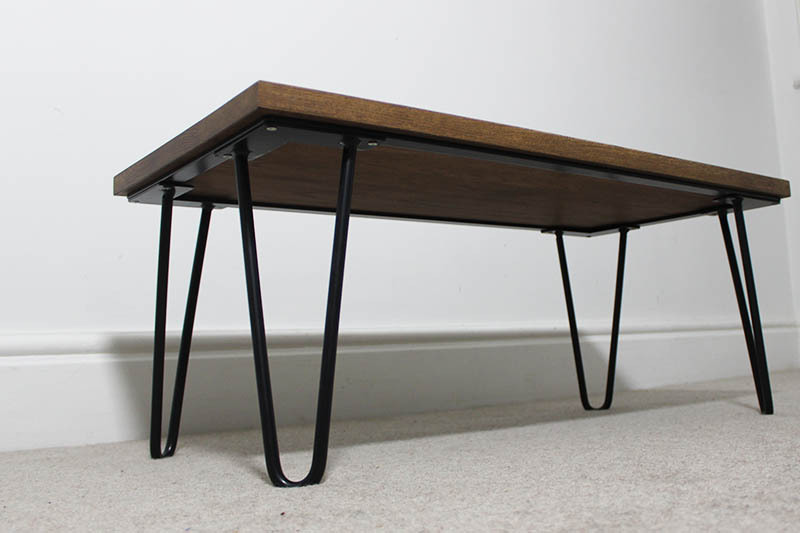 All the vintage industrial coffee tables you can see on this page are completely customisable. Contact us if you are interested in a bespoke order which will feature unique dimensions or a completely new design. We also offer a bulk order discount for commercial offices and businesses. 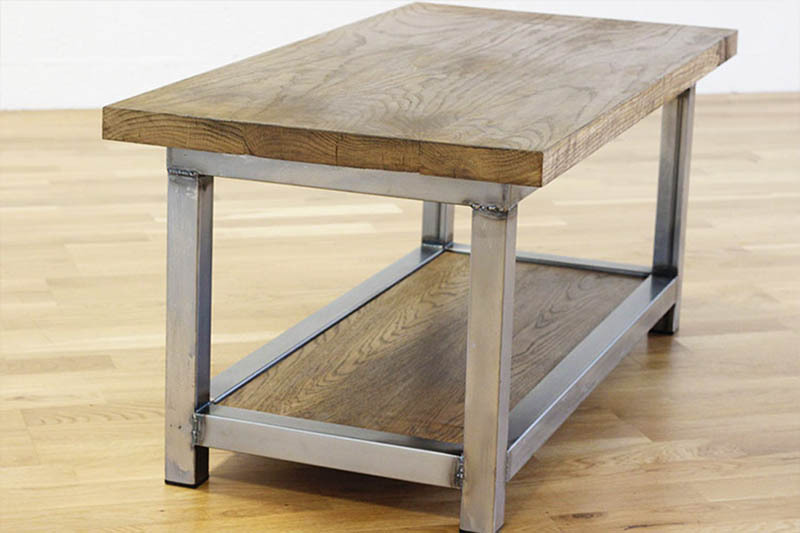 Industrial inspired the Wadsworth metal coffee table offers both a rustic and modern feel. The steel used on the photos above is bright mild steel 40mm box. The 25mm solid oak used on this product was 30mm thick and was completed with a chocolate dye. 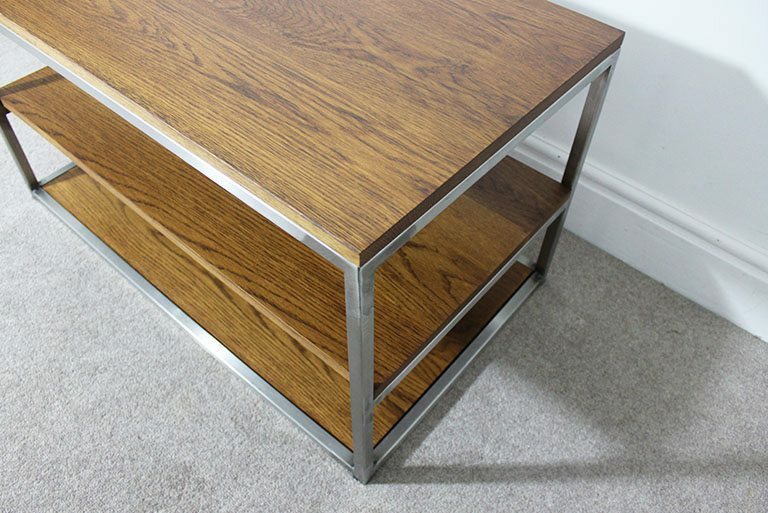 You can customise your coffee table with a choice of custom steel options and oak colours. For more information visit our oak and steel options page. 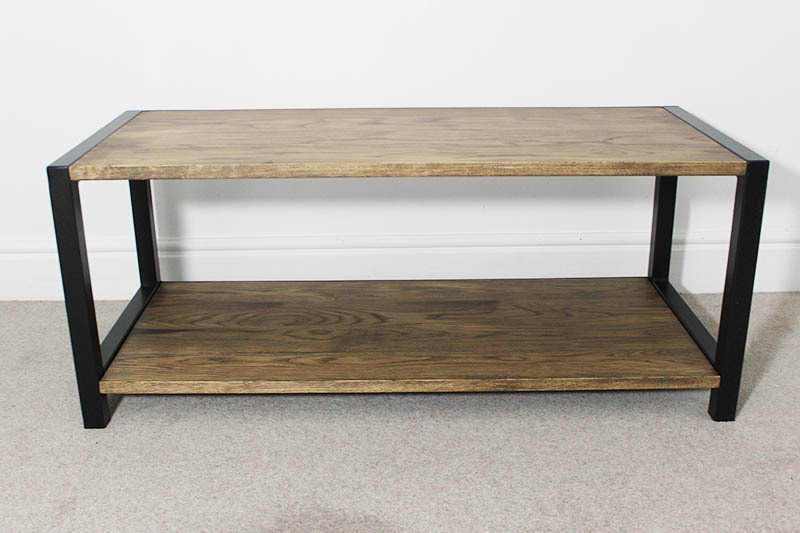 A unique design which features 2 levels of solid oak shelving. The front of this coffee table shows the oaks side features. 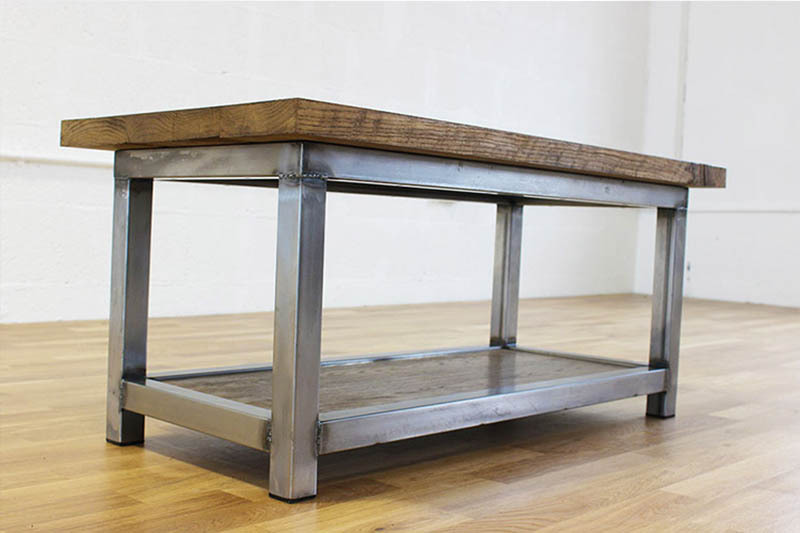 View a reclaimed style version of this table on our portfolio page. 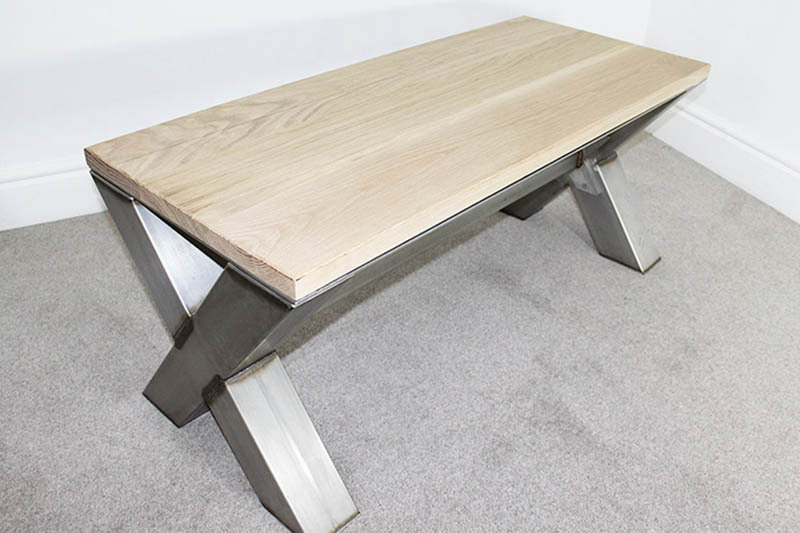 The oak on this industrial style coffee table is 25mm thick. The dye colour used is chocolate. The steel used on the images above was 40mm mild steel which was powder coated in a black grey colour. The images above show a powder coated option. For more pictures and options view this product in our online shop. View the full customisable options on the oak and steel options page. A rustic industrial coffee table featuring an style frame. The design features a center bar which can be taken out. 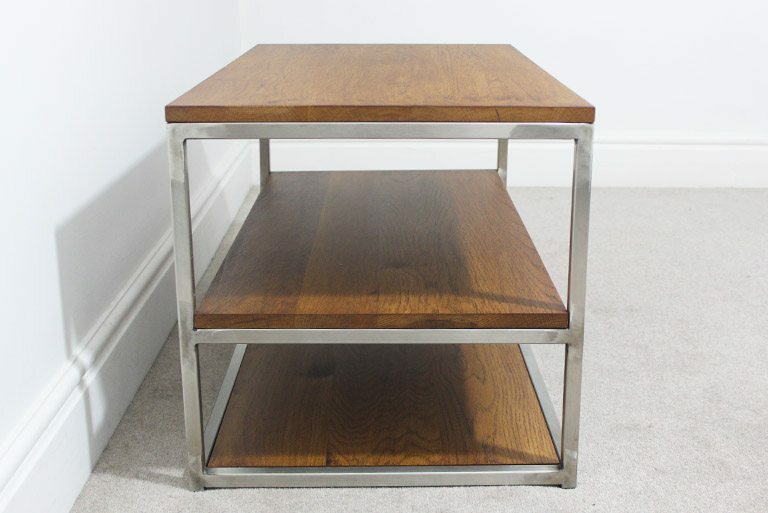 The solid oak sits flush on this stainless steel frame. The solid oak used on this design is 25mm thick. The images show the oak with no treatments applied. The metal frame on the images above is dull stainless steel. The X frame is made up of 100mm box steel. The center bar is 40mm box. There is also a flat plate frame for the oak top. 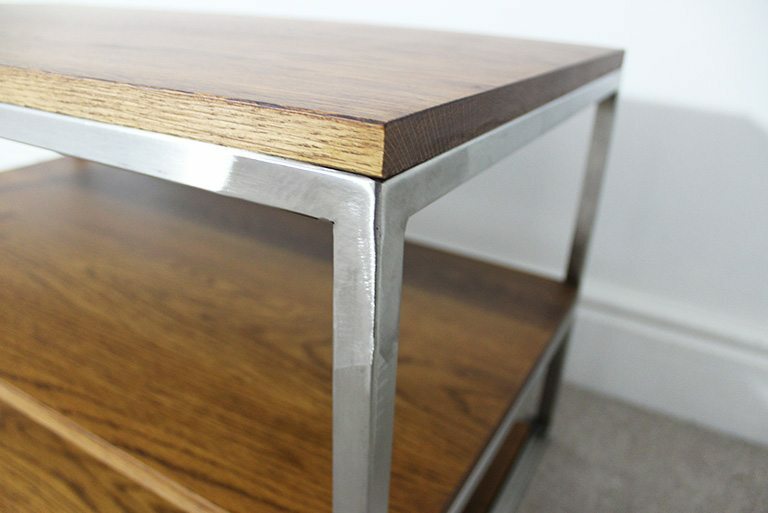 Take a look on our oak and steel options page to see all customisable features for this x frame stainless steel coffee table. 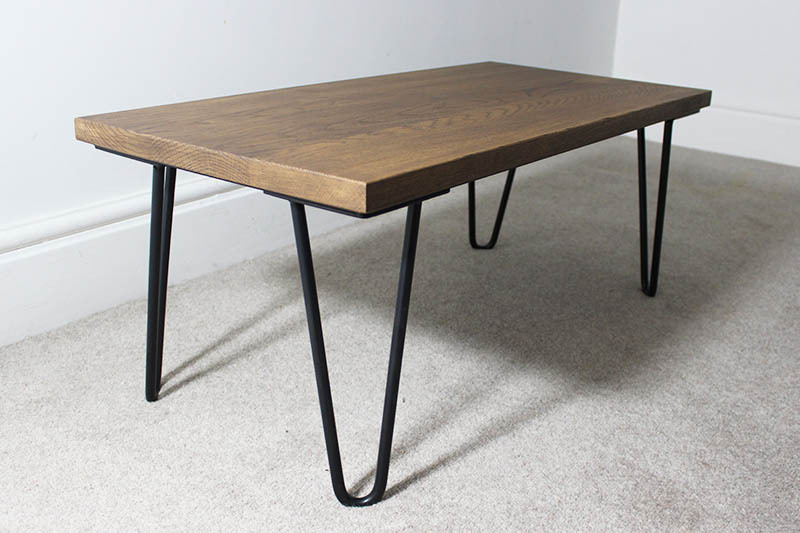 The Trace coffee table is a combination of metal hairpin style legs with a steel frame and solid oak. In the images above the steel hairpin legs and metal frame has been powder coated in a black grey colour. The wood here has been dyed with a Chocolate treatment and finished with a clear hardwax oil. The natural state of the hairpin legs will come in the Charcoal steel option. View our oak and steel options page to see the charcoal steel option and view all the oak colour options available. 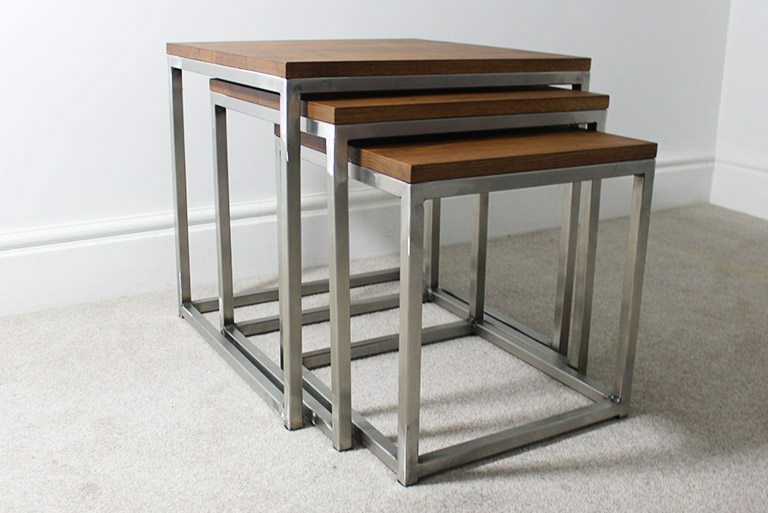 Why settle with one bespoke coffee table when you can have three! Can be made bespoke to your required measurements. View this product to see prices and standard measurements. The steel shown above is brushed stainless steel. The welds on the outside of the frames have been grinded smooth. 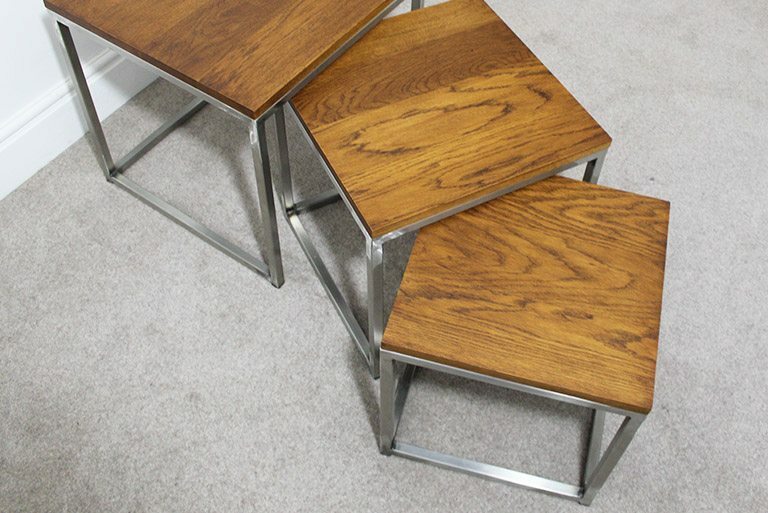 The tops have been dyed with a Dark Oak treatment and finished with a clear layer of hardwax oil. View our oak and steel options to see our full range of options. Measurements can be made bespoke. Contact us to receive a bespoke quote. 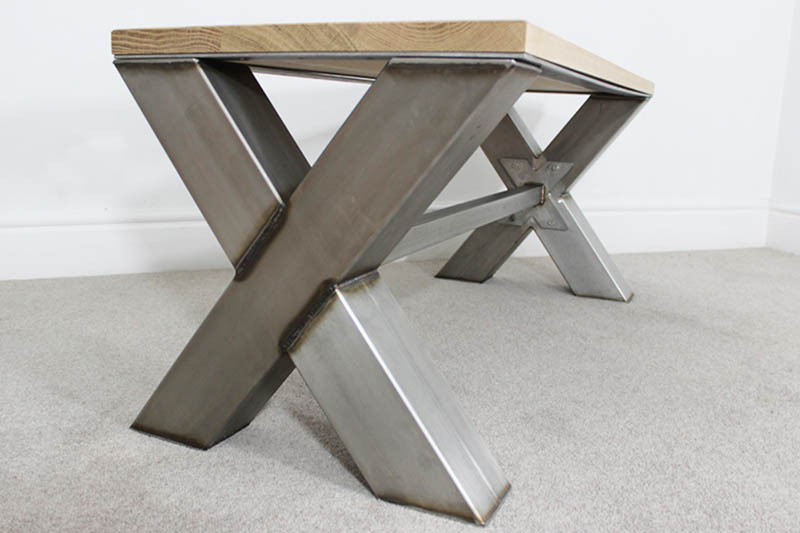 The Wallace industrial style coffee table features a unique 3 panel design showing detail of the oak sides. A quality tv / coffee table for any home or office. From the images above this design used solid oak 20mm thick panels. The oak was finished with a Dark Oak oil treatment and finished with a clear hardwax oil for protection. The steel frame was handmade with 20mm brushed stainless steel. The raw steel was originally shipped in from Germany before being cut and fabricated. 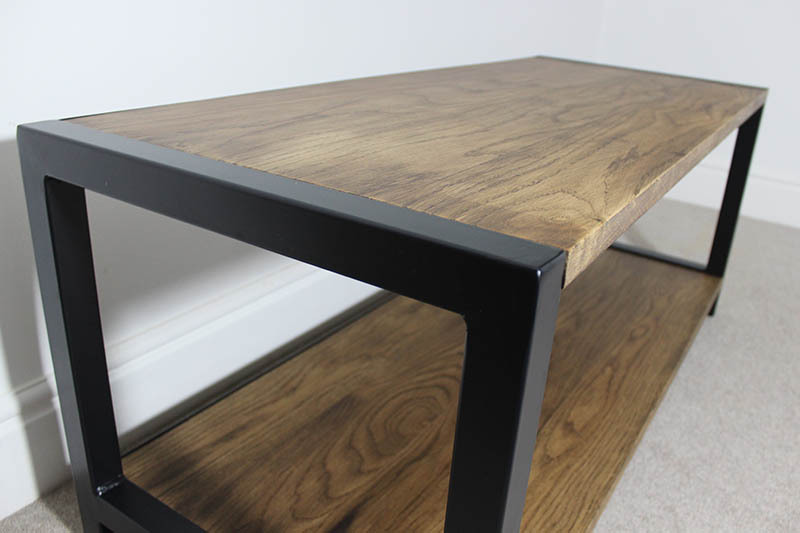 View our selection of oak and steel options on our website. Place a deposit to receive a sample pack if you would rather decide in person. For bespoke measurements contact our team before purchase. We hope one of the industrial vintage coffee tables above grabs your attention or atleast inspires you to have something bespoke made by us. 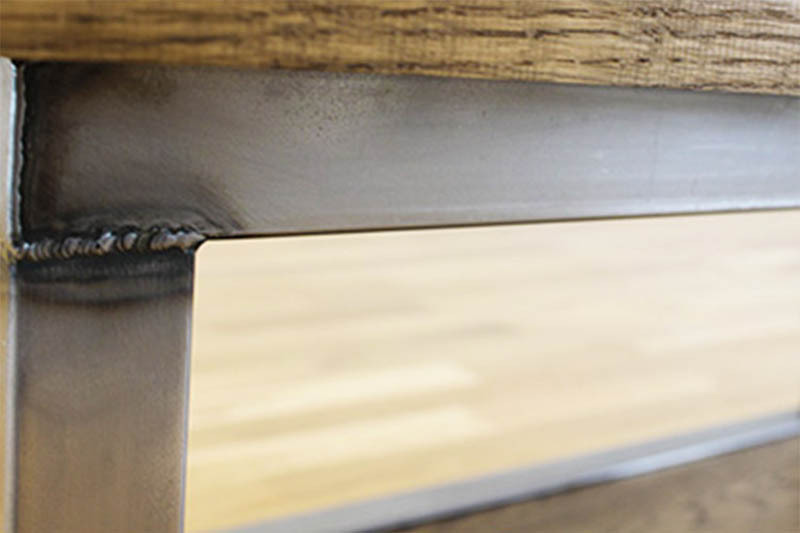 As you can see we use the wood and metal components to create unique pieces of industrial style furniture. The great advantage when working with us includes the bespoke made to measure style. 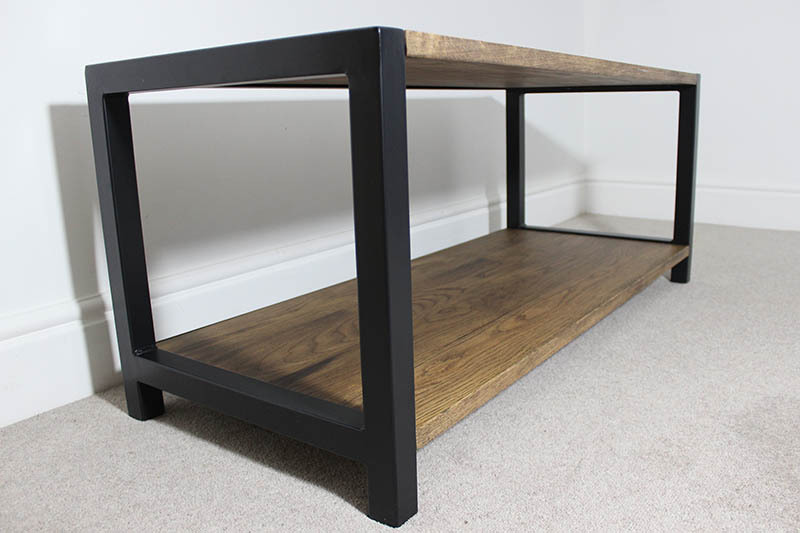 If you want your coffee table to fit into that space, simply let us know and we will make it to fit! 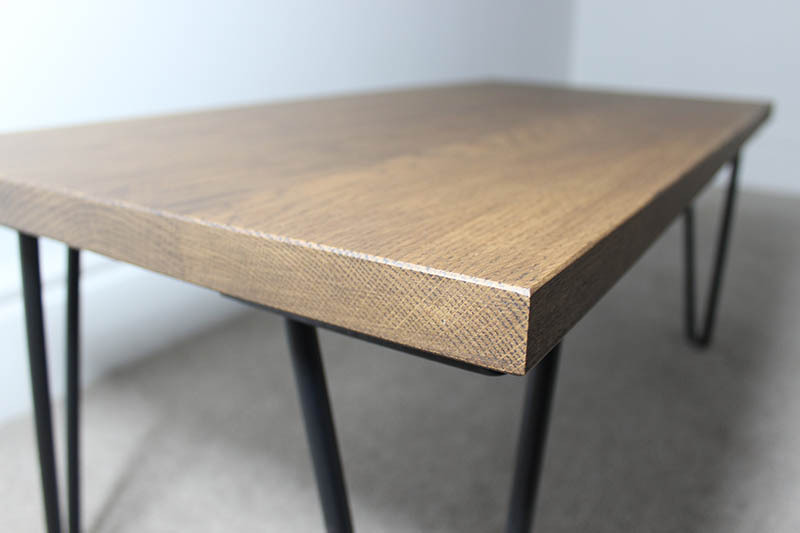 You can also customise your industrial coffee tables by choosing an oak colour which includes an oil treatment followed by a few layers of hardwax oil for protection against water etc. The steel options include charcoal, mild, brushed or stainless steel. Charcoal steel gives you more of a dark rustic finish. 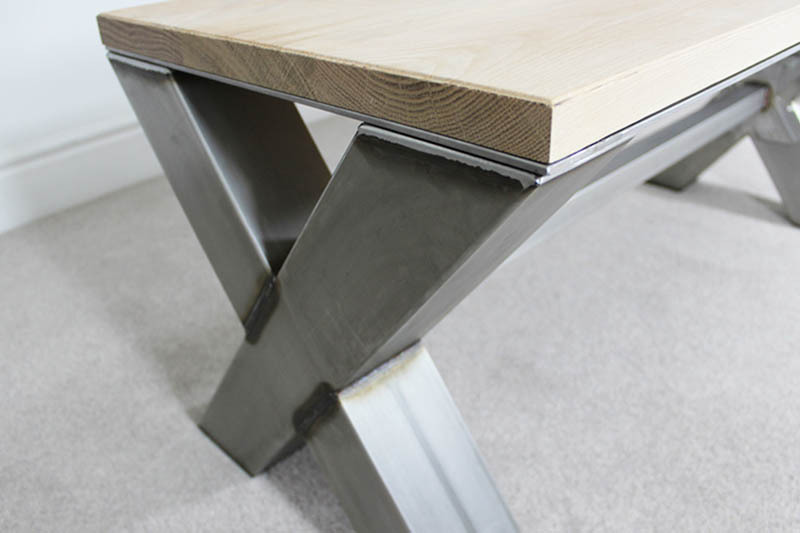 Brushed offers a slight modern shine finish to the steel. We provide a clear lacquer treatment to all out mild steel frames which prevents the steel from rusting over time however it will not last forever depending on your products location. Our delivery service is available nationwide including London. Our large and technical UK deliveries are completed by our team of couriers who will build and assemble your furniture. Anything small and fixed can be shipped using a commercial courier which can be cost effective. International deliveries are available. For a quote or more information please contact us.